Ian Keatley kicked Munster to a nail-biting 16-13 victory at Treviso in a tight Pro12 encounter. The fly-half won it with two second-half penalties as the Irish came from 10-5 down to triumph at Stadio Monigo. 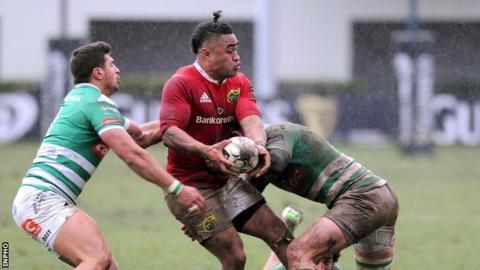 Gerhard van der Heever and Francis Saili were Munster's try-scorers while number eight Robert Barbieri crossed the line for the hosts. Jayden Hayward and Keatley traded penalties to leave the score 13-13, but the Munster fly-half had the last word. South African Van der Heever put the Irish province in control early on with his 11th-minute try, but the home side responded with Barbieri's touchdown, full-back Hayward converting. Keatley denied Hayward a try of his own after the restart when he just beat him to touch down after a foot race, but the Treviso man extended his side's advantage 12 minutes after the restart with a penalty awarded for offside. It was 10-10 within six minutes when centre Saili chased down full-back Andrew Conway's kick to touchdown, although Keatley was again unsuccessful with his conversion attempt. The sides were level at 13-13 with 12 minutes remaining, before Keatley kicked his decisive penalty five minutes from time. Alarm bells were ringing when the visitors' prop Dave Kilcoyne was shown a yellow card with three minutes left on the clock, but they managed to hang on for victory. Benetton Treviso: J Hayward, L Nitoglia, L Morisi, A Sgarbi (capt), A Esposito, S Christie, A Lucchese; R Barbieri, M Lazzaroni, M Barbini, T Palmer, F Paulo, S Ferrari, L Bigi, A De Marchi. Replacements: F Zani, C Traorè, F Filippetto, J Montauriol, D Budd, R Barbi, C Smylie, T Iannone. Munster: A Conway, D Sweetnam, F Saili, R Scannell, G van den Heever, I Keatley, D Williams; D Kilcoyne, M Sherry, J Ryan, M Chisholm, B Holland (capt), J O'Donoghue, D O'Callaghan, R Copeland. Replacements: N Scannell, P McCabe, M Sagario, D Foley, T O'Donnell, C Sheridan, C Bohane, D Johnston.